Despite some industry resistance, the digital oil field concept is helping oil and gas companies drive offshore innovation and optimisation. Now that data analysis and wireless technologies are readily available to the industry, companies must ask themselves how they can make the most of the new information age. Wireless availability allows for networked platforms that feed data back to shore. Image courtesy of Aaron Logan. Workers conduct drilling operations at Shell's Smart Fields Platform in Brunei. Image courtesy of Shell. Sensors and other automated monitoring equipment are increasingly common in the offshore sector. Image courtesy of BP. Digital storage capacity is cheaper than ever, but data must be cherry-picked to be actionable. Image courtesy of BP. As the era of ‘easy oil’ draws to a close, the long-established concept of the digital oil field (DOF) is gaining more and more traction in the oil and gas industry. For operators struggling to maximise profitability, especially those tapping costly and risk-intensive deepwater wells, the upfront cost of investing in modern information technologies is becoming an increasingly worthwhile trade-off for safer, more efficient, better-managed operations. The somewhat nebulous DOF concept, broadly speaking, focuses on leveraging the benefits of modern IT, automation and communications to enhance all the conventional aspects of oil and gas operations, from exploration and production to environmental monitoring and safety. But more than simply deploying digital and data management technologies, DOF is about unifying disparate oil field processes into a more easily digestible stream of information, making it easier to get the big picture on an operation and thus optimise productivity in real-time, while minimising the industry’s labour-intensive, hard-copy hassles. DOF is hardly a new idea in the offshore industry; whether it has gone by alternative tags like the iField, smart field or Field of the Future, the concept has long been of interest to oil and gas majors such as BP, Shell and Chevron. But like many other heavy industries, almost all of which are now under the influence of the digitisation trend, the oil and gas sector’s fundamental conservatism – its preference for proven and familiar strategies over disruptive innovations – has hindered the pace at which these technologies are adopted. "DOF is about unifying disparate oil field processes into a digestible data stream." This resistance to change is still a major issue, as an industry poll carried out in 2012 makes clear. The poll, run by BP in March last year at the SPE Intelligent Energy International event in Utrecht, Netherlands, revealed that 60% of those surveyed believed that resistance to change represented the biggest obstacle to realising the full potential of the DOF. BP’s field of the future vice president Steve Roberts expressed worry that this suspicious attitude to innovation was still such a factor. "It has to be a concern that IE2012 delegates believed resistance to changing work practices due to new technology could impede that development," he said. "We in BP believe that standing still is not a viable option, and that it’s our responsibility as an industry to encourage a culture shift and acceptance of the new. Failure to do so will result in a significant loss of opportunity, which none of us can afford." Nevertheless, as both onshore and offshore operations become increasingly complex, the digital oil field technology market has steadily grown over the years, raking in an estimated $18.7bn in revenues in 2011. And according to market reports, this oil and gas sub-sector is on the up, with a compound annual growth rate (CAGR) of 4.8% expected until 2022, when the industry is expected to be worth $33.3bn. Western Europe and North America, with their mature industries and often-tricky offshore operations, are still the largest presences in the DOF market, with the former representing nearly 27% of global DOF revenues. While rapidly industrialising regions, such as the Middle East, have in the past focussed on simpler oil extraction projects that don’t necessarily require major tech innovation, this situation is changing and Middle Eastern companies are now catching up with their Western counterparts. In fact, the Middle East is expected to be the fastest growing market in the field during the next decade, with a predicted CAGR of 5.9%. At the heart of the digital oil field is wireless networking, which provides the high-speed communications backbone that makes the majority of DOF innovations possible. In many quarters, the introduction of maritime wireless systems is considered a significant step up from the conventional satellite very-small-aperture terminal (VSAT) technology traditionally used in the industry because of the lower latency and higher bandwidth that wireless can achieve. "Increased wireless connectivity brings the benefit of remote monitoring and control." ERF Wireless president and CEO Dr. Dean Cubley attested to this sea change in communications technology for the oil and gas industry in an interview with Energy Digital in March 2013. "There was a need for a wireless solution to replace the traditional VSAT circuits that were too slow, expensive and lacking the amount of bandwidth needed to run the very intensive software programmes between well sites and central offices." From a pure production perspective, increased wireless connectivity in the offshore industry brings the benefit of remote monitoring and control, with onshore specialists able to continuously supervise key production processes to troubleshoot potential problems at an earlier stage and maintain a more reliable flow of resources. Data from deployed sensors and other equipment provides a real-time (or near real-time) link between platforms and onshore engineers, who, in a well-integrated DOF operation, should be able to manage multiple applications from a single screen that could be thousands of miles from the offshore well itself. Functions that are remotely analysed could range from engineering simulations and lifecycle management of machinery to wellhead production or electromagnetic survey data. 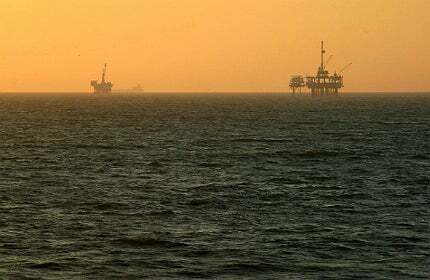 The gradual transfer of the majority of workers from offshore platforms to onshore control centres allows a big-picture view of operations, but it also reduces overhead costs by facilitating centralised asset management with smaller teams, addressing many of the problems presented by the industry’s shrinking, ageing workforce. And with the improved safety that comes from automated monitoring and fewer helicopter trips, it appears that DOF has sounded the early death knell for the days of large numbers of platform-based personnel. Of course, actually fulfilling the promise of these DOF advantages isn’t as simple as installing wireless comms and pressing the ‘on’ switch. As well as the technical issue of possible signal interference from overlapping wireless networks and radio frequency noise, the sheer breadth of data that can be harnessed from platforms can do as much to paralyse decision-making as liberate it. As GE Intelligent Platforms global industry manager for oil and gas Mayank Mehta put it in a November 2012 article for E&P: "With the decrease in costs of servers and storage equipment, it is easy to fall into the trap of data and information overload. A balance between ‘not enough’ and ‘too much’ is crucial for ensuring that decision support systems have the relevant data." As such, implementing the DOF eco-system is a formidable task of integration and optimisation that requires the top-down reorganisation of workflows. That some oil and gas companies are intimidated by the process is understandable, but with the deployment of the right technology and data management techniques, information overload is something that can be tackled. At the platform itself, important information can be cherry-picked from data streams using pre-processing and data reduction techniques. These algorithmic techniques pick actionable information out of the data scrum so that only relevant material makes it back to remote control centres, while also saving costs on data storage facilities. "The sheer breadth of data can do as much to paralyse decision-making as liberate it." But as David Dungate of technology consultant Tessella warned in late 2012: "Developing successful data reduction methods that significantly reduce data volumes by pinpointing pertinent data but that do not throw away information that might be of value is complex." Again, enterprise-wide collaboration and careful implementation is essential. In terms of making relevant data streams digestible for remote users, a range of visualisation software from companies like Cyviz and VSG has become increasingly sophisticated, allowing complex information to be converted into clear graphics that make the decision-making process easier. And, as small-scale computing becomes ever cheaper and more commonplace, companies are increasingly turning to tablet devices to organise data in a networked system. Offshore oil platforms and their ancillary operations produce reams of data every day. The digital oil field, at its core, is about burrowing into that data and sharing it to drive innovation and improved performance in a host of areas. But extracting the data itself is not enough – the real revolution is in how this information is presented. "Oil companies constantly strive to improve safety for oil field workers, boost well performance and respond more immediately to the market – but it all ultimately depends on data and how it is used," said Barry Irani, president and CEO of iStore, which supplies PetroTek Optimisation and Production Surveillance software to the oil and gas industry. "So it really is about tapping the hidden potential of a company’s vast reservoir of operations and production data, clearly communicating it to the right people and giving them the tools to quickly act on that information." As new offshore leases become available, experts are sounding the call for improved disaster oversight. The world’s first wave and solar powered autonomous ocean data capturing robot has received funding to begin work in the offshore oil and gas industry.